Kathryn Westbeld scored 20 points, Jessica Shepard added 18 and Notre Dame reached the Final Four for the eighth time in school history by defeating Oregon 84-74 on Monday night at the Arena. 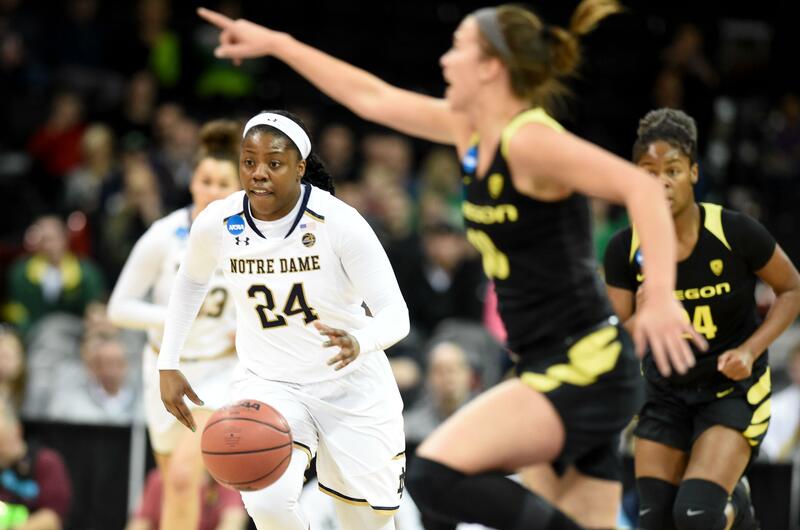 Westbeld came up with the biggest game of her Notre Dame career despite being slowed by an ankle injury suffered in the first round of the NCAA Tournament. Westbeld had scored a combined 12 points in the previous four games, but she teamed with Shepard for an inside attack that hurt the Ducks. Despite a handful of costly injuries along the way, the Irish are back in a familiar spot in the national semifinals. It’s the sixth Final Four for Notre Dame since 2011 and old friend UConn awaits in the semis Friday night in Columbus, Ohio. Notre Dame’s defense was a big reason why Oregon shot so poorly. After a first half that was an offensive showcase, Notre Dame did a better job of pressuring Ionescu and getting the ball out of her hands in the second half. When she did get a shot attempt, it was often a challenged look. Published: March 26, 2018, 8:04 p.m. Updated: March 26, 2018, 8:34 p.m.